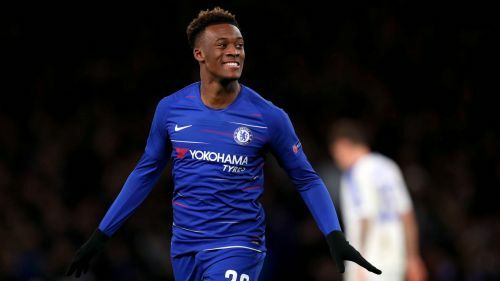 Callum Hudson-Odoi needs to improve before he can be considered a great player, according to Chelsea boss Maurizio Sarri. The 18-year-old has been used sparingly by the Italian this season but has still done enough in his limited appearances to attract the attention of German heavyweights Bayern Munich. He scored against Dynamo Kiev on Thursday, netting late on as Chelsea strolled to a 3-0 Europa League last-16 first-leg win at Stamford Bridge. Chelsea fans are desperate to see Hudson-Odoi given more starts but Sarri believes he needs to improve out of the spotlight before he can establish himself in the Blues' starting XI. "Hudson-Odoi is a very important young player but he is 18 and needs to improve," he told a media conference. "He has convinced me he is a very great player. I have my opinion and he cannot be at the top yet. "He needs to improve because he can arrive at the top only at 22 or 23, like every other player. "So, I now think we need to improve without the pressure of the media, without the pressure of the fans, without the pressure of the club. "I think it's very dangerous, at 18, to have this pressure. You have to improve, tactically, mentally and physically at that age." Hudson-Odoi's late goal added to earlier strikes from Pedro and Willian to give the scoreline a more accurate reflection of Chelsea's dominance. Sarri admits, though, that his side should have been out of sight by half-time given the volume of chances they created against an insipid Dynamo outfit. When asked if they should have scored more, he replied: "Yes, of course, especially in the first half. We could have scored more, but the result is a good result. "We were able not to concede a goal at home, which is very important in this competition. "We have to be careful. We have to play the second leg [on March 14] and go there with a very good level of attention and application because we want to qualify."